Prototype: French State Railways (SNCF) class BB 9200 electric express locomotive in the classic paint scheme of "Le Capitole". Built starting in 1957. Model: This locomotive is new tooling. It has a built-in digital decoder and sound generator for operation with DCC and Selectrix. The motor has a flywheel. 4 axles powered. Traction tires. The headlights and marker lights change over with the direction of travel. Warm white LEDs are used for this lighting and there is cab lighting and engine room lighting. All of the lighting can be controlled digitally. The locomotive has a close coupler mechanism. It also has separately applied grab irons. Length over the buffers 101 mm / 4". Cars to go with this locomotive can be found under item numbers 15950 and 15951. T16691 – "Le Capitole" Class BB-9200 Electric Locomotive + Express Train Passenger Car Set The success story of the so-called "Jacquemins" as the first quasi French "standard design locomotive" for the SNCF established in 1938 began with the class BB-9200, of which 92 units were purchased from Creusot-Loire, Jeumont-Schneider, and CEM in the years 1957-1964. They were equipped with four type GLM 931 B DC motors from Alsthom and JH (= Jeumont Heidmann) type electrical controls with a cam control mechanism. They ran on newly developed "Jacquemin" design trucks, which ensured outstandingly quiet running with little vibration at the same time managing higher levels of startup power. The cardan joint transmission by means of hollow shafts as well as the low mounted coupling of the trucks by means of drawbars were new, which distributed the torque from the motors to several contact points in the locomotive frame. The well- known SNCF designer Paul Arzens was responsible for the external design of the "Jacquemins", and he created the characteristic locomotive body with its rounded ends and playful applications such as headlights and end emblem ("moustache"). The class BB-9200 units worked from Paris going out chiefly in express passenger service to the Southwest of France. Yet in addition to pulling the prestigious "Mistrals" between Paris and Marseille, they could also be seen pulling 1,800 metric ton freight trains. They were capable of hauling a 1,000 metric ton passenger train (20 cars) at 160 km/h / 100 mph on level track, an 800 metric ton passenger train (16 cars) on a 0.08% grade at 120 km/h / 75 mph, and a freight train of 1,860 metric tons at 44 km/h / 27.5 mph on a 0.5% grade. At the request of the SNCF, the last two units of the locomotives delivered by Creusot in 1964 were equipped with gearing for a maximum speed of 250 km/h / 156.25 mph. They were also given more powerful motors (4,200 kilowatts / 5,630 horsepower). They reached their pinnacle starting in 1967 when the SNCF decided to introduce a speed of 200 km/h / 125 mph on the line Paris – Toulouse. 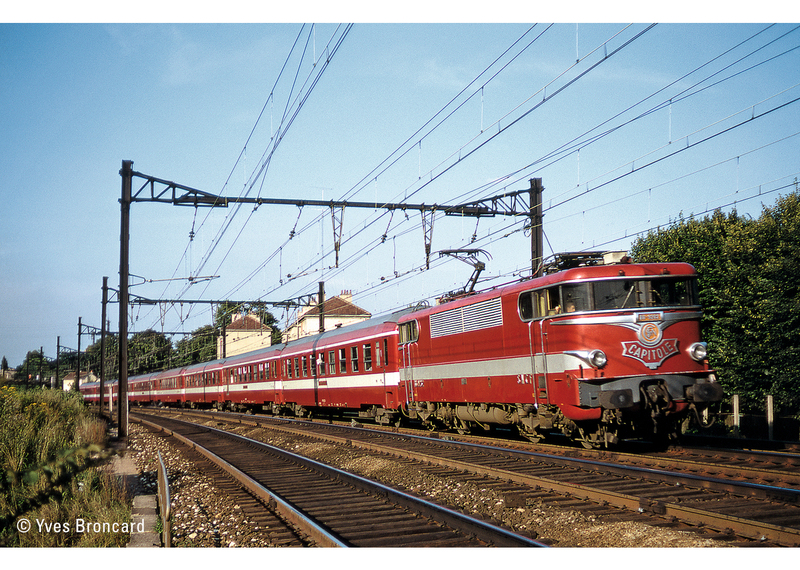 For the introduction of the new star train "Capitole" with its red exterior paint scheme and white stripes on May 28, the SNCF also applied the striking red paint scheme with the large logo of the train on the ends to their two fastest units (9291 and 9292). In addition, road numbers BB 9278, 9281, 9282, and 9288 were repainted for the "Capitole" and they were given gearing for 200 km/h / 125 mph. Starting in 2003, the star for the locomotives began to sink drastically and by September 2011 the last unit had been taken out of service.